Version 1.0 - Released July 3, 2013. 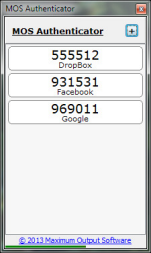 The initial release of MOS Authenticator. Added right-click context menu to sites list. Site names can now be edited -- right-click and select Edit Site. Registers itself as a "otpauth" URI handler, so you can click appropriate links in web pages to add sites. Clock synchronization now takes place every three hours rather than just at startup. You can force a clock sync by clicking the clock. Allows pasting of an otpauth URI into the Add Site screen. The URI will be parsed and the input fields will be populated with data from the URI. If you modify the shortcut to use a hotkey, MOS Authenticator will now pop up onto the screen more reliably. Site names are left-justified rather than centered if they are wider than can fit in the window. Double-clicking a site copies the authorization code to the clipboard, and minimizes the window. Added "Add Site from Clipboard" option in site context menu when an otpauth URI is on the clipboard. Added option to enable/disable auto-minimize when double-clicking on a site entry. Right-click the site list for this option. The width of the window is no longer fixed; you can resize horizontally as well as vertically. Adds a 'Small Text Mode' view option to make the site list more compact. Right-click the site list to see this new option. Adds a 'Hide Codes Until Selected' view option to hide the authentication codes until a site has been selected. Right-click the site list to view this option.